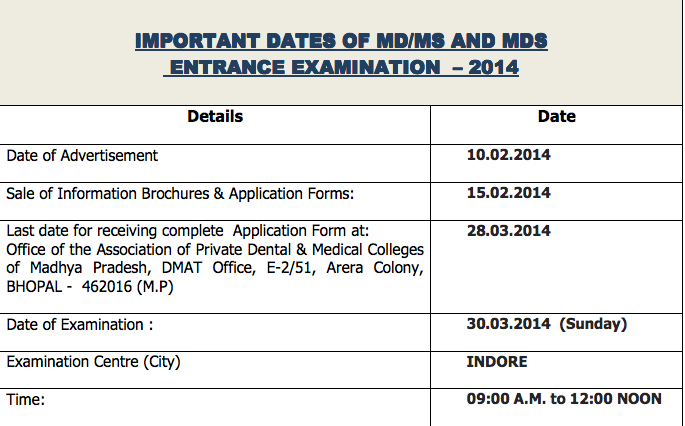 ASSOCIATION OF PRIVATE DENTAL AND MEDICAL COLLEGES OF MADHYA PRADESH is conducting Pre-PG DMAT for admission to MDS course in Madhya Pradesh. (Excluding HRA and Car Allowance)18-32 yrsBachelor in Dental Surgery (BDS) from a recognized Institution / University. 3 years experience preferably in a Dental College / Hospital etc. Age Limit - 21 to 32 years as on Jan 01,2014 CANDIDATE MUST HAVE CLEARED ODIA LANGUAGE EXAM IN 1OTH STANDARD Selection Process- Selection of the candidates will be on the basis of career marking and written test.Test will be held at Cuttack only. How to apply - Interested candidates may apply through online mode. House Surgeons and 3 vacant posts of Junior House Surgeons for a period of six months only in this institution. A candidate must have the following qualifications. 1. Must have passed BDS from a Dental College/Institute recognized by the DCI. District Health and Family welfare society is conducting walk in interview for the post of Medical Officer (Dental) for General Hospital Sec 6 panchkula, Haryana.